Snow White gets an amazingly adventurous overhaul in author of the Defiance series C. J. Redwine’s retelling. Princess Lorelei has magic in her, but her mother never taught her to use it. After the queen’s death, all the happiness and joy fades, and Lorelei’s magic turns into something dangerous. Hope is restored when her Aunt Irina marries the king. People are smiling again, the young prince’s nightmares go away, and Lorelei begins to learn to control the magic in her veins. But it’s all a lie. Princess Lorelei can see the evil web her Aunt Irina has woven about the castle after the queen’s death. Everyone around the castle is eating the poisoned apples—symbolically representing the queen—so beautiful on the outside but rotted to the core. There is plenty of symbolism and metaphor in Redwine’s novel. Lorelei defies the queen and in the process loses the kingdom, her father is killed, and she and her brother, Prince Leo, must go into hiding. Along the way they are Robin Hood—stealing back from the queen the food she demands from the villagers that can ill afford it in the meager months—and soon the villages are willing to stand with the fugitive princess and help her win back her home. Nearby in the kingdom of Eldr is a prince made king too soon. Kol is desperate for magical help, and his only option is the wicked queen Irina. In exchange for her assistance to beat back the dangerous ogres threatening his borders, he becomes a huntsman and must track and kill the hiding princess. However, this huntsman is far more dangerous than any human one—he is a shapeshifter, and he turns into a dragon. This wouldn’t be a proper fairytale without romance, however. Soon Kol (get it, King “Cole”?) is in love with Princess Lorelei, and together they must face the dangers of the queen and the world around them in order to find their rightful places on the throne. Redwine focuses on character and plot to move the story along, often leaving the setting somewhat lacking and up to the reader to fill in with few details, if any, to place them in the story, which is unfortunate. This story is imaginatively retold and fans of YA will find it hard to put down this swiftly paced novel as they are caught up in the rapid narrative tide. The characters are lovingly crafted and given motivation and maturity as they move forward throughout their struggles. 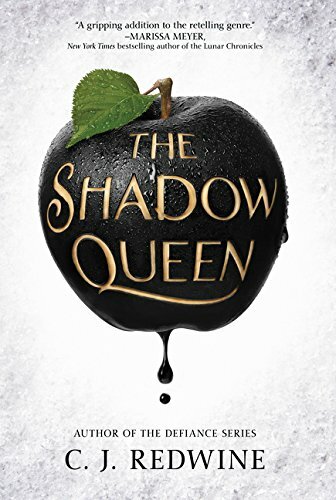 There are unique elements to this retelling, and Redwine makes this version of Snow White all her own with a princess telepathically linked to a gyrfalcon, a shapeshifting king, more magic than the Disney version—and far more horror, too. The characters are likeable, which is a relief because the narrative switches third person point of view between Kol and Lorelai and occasionally Irina, which is a fantastic change. Readers who often want to know the backstory and the elements of the wicked stepmother, the witch, or the evil doer in any fantasy will enjoy the change of pace that lets them peer into her poisoned mind.